Gregory S. Stone is Executive Vice President and Chief Scientist for Oceans at Conservation International (CI). He pioneered research in Antarctica on marine mammals and later ice ecology and has given a TED talk and lectured throughout the world. Greg is widely published in scientific literature, National Geographic Magazine, and authored three award-winning books (the most recent, 2012, UNDERWATER EDEN, University of Chicago Press). 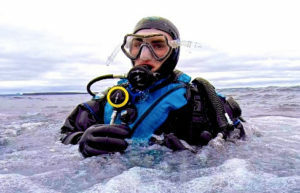 He is a specialist in undersea technology and exploration and has logged thousands of hours SCUBA diving in all five oceans. His numerous accolades and professional associations include being named a National Fellow of the Explorers Club, awarded the Pew Fellowship for Marine Conservation, and the National Science Foundation/U.S. Navy Antarctic Service medal for his research in Antarctica. He’s been named one of the five “Bostonians of the Year” by the Boston Globe in 2008. Today, his work with CI focuses on global solutions for the oceans which include a metric for measuring ocean health, fisheries management, and ocean stewardship.